Britain's government pulled out all the stops on Thursday in an effort to bring the opposition on board for a final attempt to avoid a no-deal Brexit. Prime Minister Theresa May is searching for votes to support her unloved EU withdrawal deal, hoping to push it through the British parliament on the fourth attempt. Downing Street said there was “urgency” and both sides were involved in “intensive discussions” to agree on a compromise, according to reports from the AFP news agency. Resistance to May's withdrawal deal remains strong and the latest Brexit deadline is 12 April. MPs supported a bill on Wednesday forcing the prime minister to seek a new delay. EU leaders have become tired of the drama surrounding several votes on various Brexit scenarios and hope to have either a deal agreed by the British parliament or a new way forward agreed before a meeting in Brussels on Wednesday, AFP reports. Two alternatives are viable – forcing May to accept another extension with a view of giving the UK more time to rethink Brexit or letting London pursue a hard Brexit. May worked to flatter the opposition this week including a long meeting with Labour Party leader Jeremy Corbyn. Discussions reportedly dragged on for more than one and a half hours and were described as “cordial” but not decisive, AFP said. Michel Barnier, the EU's top Brexit negotiator, said on Thursday that cross-party talks to put an end to the deadlock were welcome. Although he tweeted that it was “time for decisions”. May's talks with Corbyn, who favours a closer alliance with the EU including a customs union, has angered right wing politicians and led to the resignations of two junior ministers. A cabinet minister speaking to news website Politico described May's position as having “nowhere else to go”. 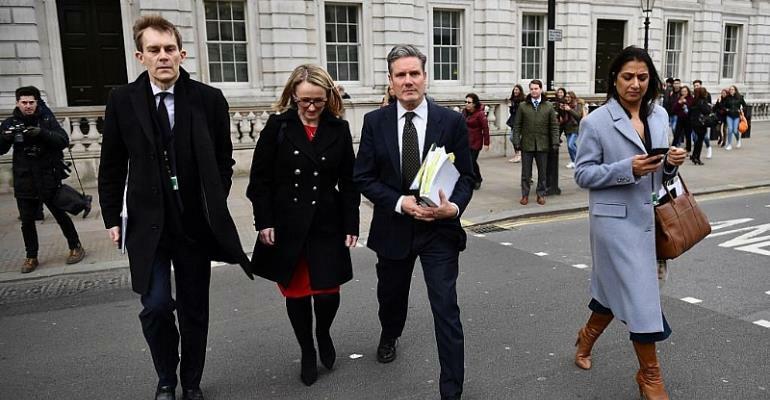 Meanwhile, pro-EU members of May's inner circle said the government must compromise with Finance Minister Philip Hammond saying during a television interview that there would be “pain on both sides”. Other cabinet members publicly undermined May's attempts to reach out to the opposition and criticised Corbyn's politics. Health Secretary Matt Hancock told British public radio that Corbyn was a “Marxist who never once in his political life put British interests first”.